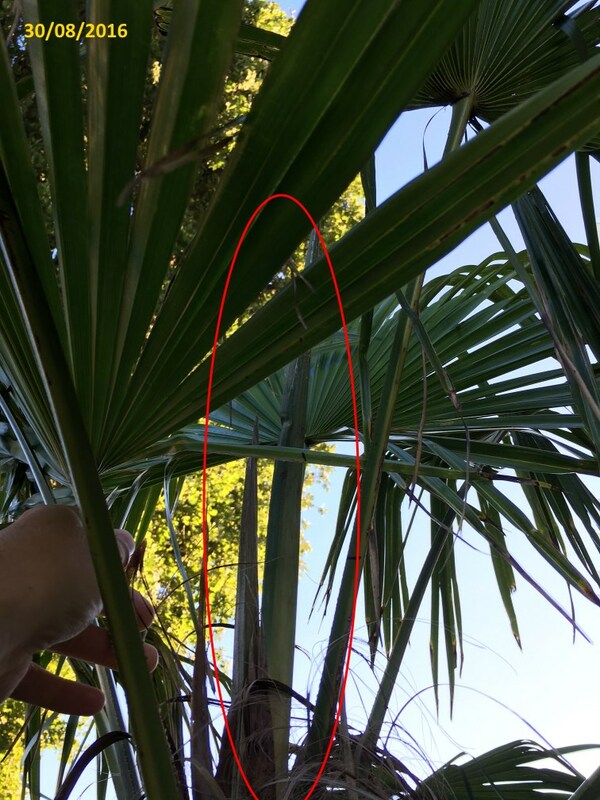 Why does my palm tree degrades after planting? 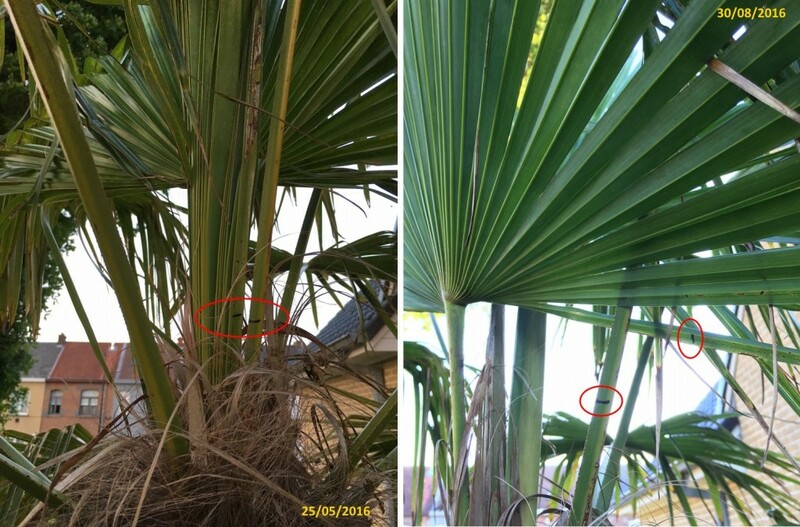 We regularly receive the question, not infrequently with a slight panic, why the newly planted palm suddenly starts to become ugly. What should I do? What have I done wrong? Fortunately, in most cases, we can reassure you. 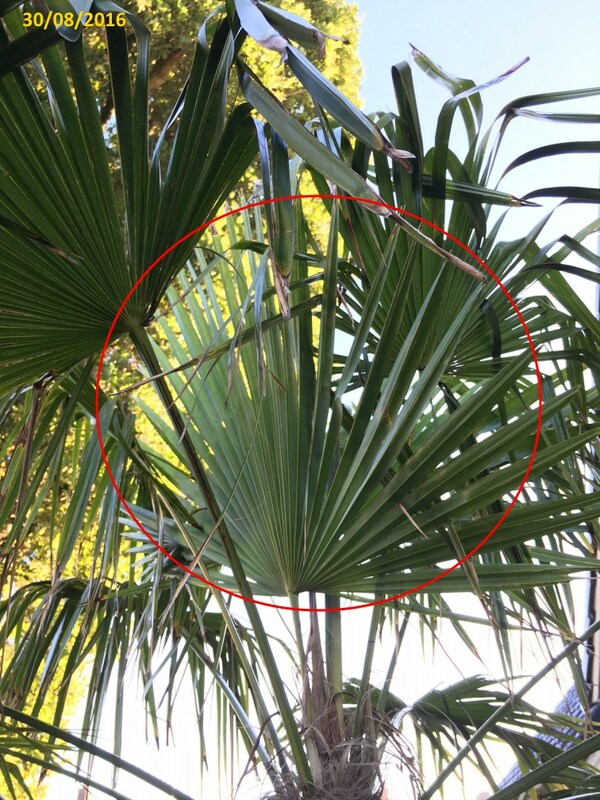 It is quite normal that a newly planted palm will decline slightly. This is due to the sudden change of environment. Especially when the change is significant, for instance a freshly imported palm from Spain that is suddenly placed in the cold climate. In this article we show you our Trachycarpus fortunei (Chinese windmill palm), which was planted in 2015. 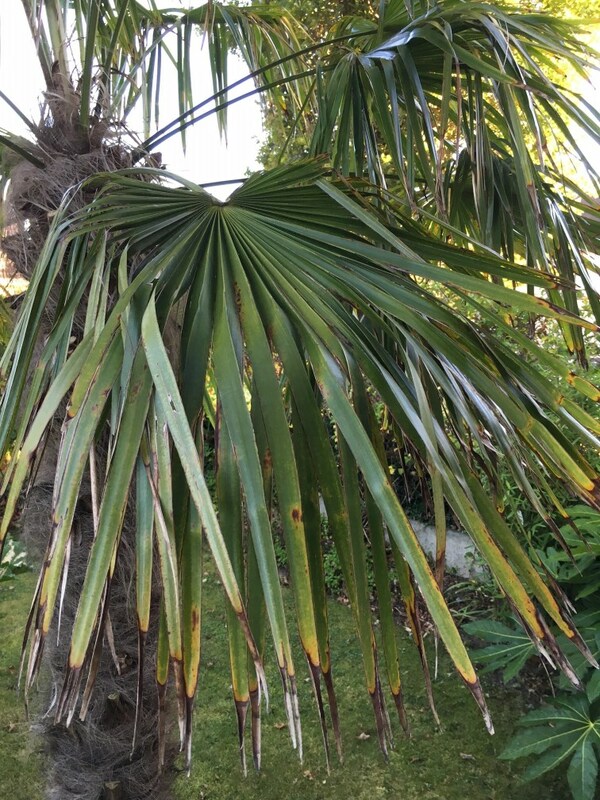 This palm was imported just a little bit earlier from north-east of Spain and came here in our garden in clay soil on a draughty North-West-facing site. Of course not ideal, but this species should in principle adapt. Below you will find his evolution from planting to the first signs of new growth! NB. Of course, this article also applies to species other than Trachycarpus. The main difference will be the growth rate and therefore the time it takes for the palm to grow again. A Washingtonia, for instance, will sooner pick up growth. 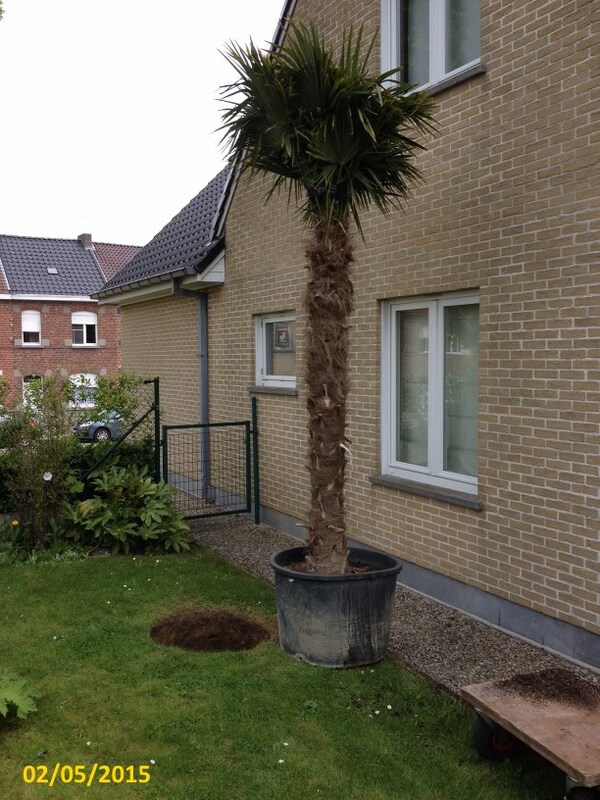 Because this palm has less leaf than a Trachycarpus, its condition often looks even more disastrous. During the planting this palm still had a beautiful full crown. Below you can see its evolution in the following year. You can see that the leaflets folded and the leaves hang down more. The whole palm gives a less vital impression. It’s only in april 2018 that we see new compact leaves being formed, 3 years after planting. Still, we have to say that this isn’t the easiest part of the garden with a very dry soil, draft and not that much sunlight. 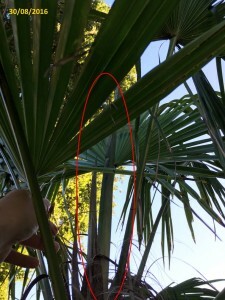 In order to be able to follow the growth more closely, we drew a line with a waterproof marker over the new leaf in the heart of the palm and the petiole next to it. (red circles). As you can see on the picture on the left, made more than a year after planting, there was still no growth visible since planting. On the picture on the right, took three months later, you can see how the leaf has finally come up and was deployed. The leaflets are no longer folded. In the heart there are also two new leaves (spears). 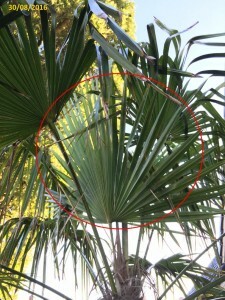 It took more than a year for the palm to adapt to the new location and to recover its growth. However, during this period we never ceased to water sufficiently, especially on sunny and/or windy days. Even in winter if necessary. We have not provided any fertilizers since planting. In the plant hole we only mixed some bone meal to stimulate root production. Of course, the success of this project is also partly due to the fact that we started with a palm of good quality.